from Palm Beach and Martin County regional science and engineering fairs. 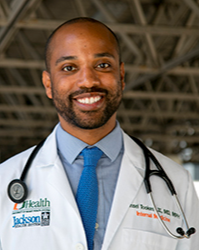 Hansel Tookes, MD, MPH is Assistant Professor in the Department of Medicine at the University of Miami Miller School of Medicine. He joined the faculty in the Division of Infectious Diseases after completing his residency in Internal Medicine at Jackson Memorial Hospital. He is the Principal Investigator of the UM Harm Reduction Research Group. He has received numerous honors including Starbucks Upstander, Miami Chamber of Commerce Healthcare Hero, and SAVE Champion of Equality. He is a member of the Board of Governors of the Florida Medical Association and is a delegate to the American Medical Association. Prior to medical school, Dr. Tookes worked in public health. He graduated from Yale University with a B.S. in Molecular, Cellular and Developmental Biology. Mr. Tookes is also a graduate of the JA participating Benjamin School.